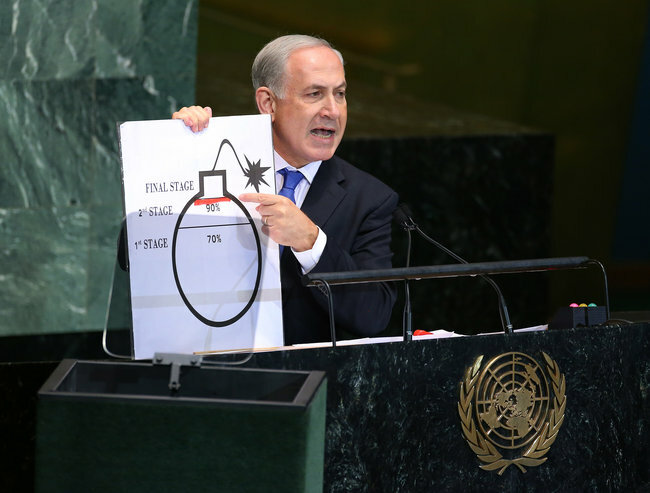 Isabel Kershner and Rick Gladstone report that Israelis are confused about what Netanyahu's bomb diagram meant at the UN. And of course they are -- it wasn't actually a diagram meant to communicate useful information about anything. It was just an crude attempt to stoke fear of Iran, and nudge the US into a disastrous military conflict. I'm glad to see that people in the US mostly just made fun of him. For context, it's good to take a look at Justin Logan's old post on estimates of when Iran would have the bomb. Did you know that Iran was only a few months away from having two or three nuclear weapons in 1991? And 8 to 10 years away in 1993? They were still 8 years away in 1995, but made up enough ground to be 4 years away in 1996. Then they were 5 years away in 1998, and maybe they already had one in 2000. If you go by those estimates, it's not a problem for Iran to have the bomb, because they've had it forever now. Oh, no! And Israel won't have nuclear weapon capacity for another, oh, -45 years or so. Not that a hostile nuclear presence in the neighborhood should bother Iran, right? Yup, fairly ridiculous (also remember that Netanyahu pushed back when they'd cross the "red line" by another year from his previous statements). I would remind people that there does seem to be a push for a war with Iran coming from many of the neo-conservatives that are now surrounding Romney in the form of demanding a use of force authorization from Congress to "negotiate" from a "better position." But we of course know what would happen under another neo-con cabinet. A authorization of the potential use of military force would become a approval of large scale war. We would be put into "crisis mode" as in "this has to be resolved right now." And of course any potential deal offered by the Iranians or a third party would be rejected as not good enough. Just like the lead up to the war in Iraq. Indeed, Romney's communications director, I mean WaPo blogger, Jennifer Rubin has thrown her weight behind this plan too.